The U.S. Geological Survey National Earthquake Information Center (NEIC) has the unique task of reporting seismicity globally and domestically in near-real time. In 2018, the NEIC cataloged ~30,000 seismic events, including 134 earthquakes magnitude 6 and larger. Beyond rapidly estimating the location and size of earthquakes, the NEIC produces a variety of high-level products estimating the source characteristics and impact of events. This information is rapidly distributed on the web to inform a range of consumers including the public, media, and emergency responders. In this effort, the NEIC relies on real-time data from over 2000 globally distributed seismic stations. Detecting and characterizing earthquakes both large and small has a unique set of challenges. Large earthquakes are infrequent and complex. Small earthquakes are difficult to observe and characterize. Here I will discuss the rapidly evolving NEIC monitoring framework and its development priorities. This includes a range of new tools aimed at improving detection capabilities such as (1) a recently developed seismic phase associator aimed at simultaneously monitor seismicity on global and domestic scales, (2) the real-time use of correlation and subspace detectors to automatically documenting small, repeating events, and (3) the development of machine learning tools aimed at characterize automatic detections. 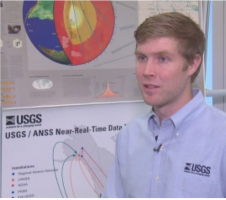 William Yeck is a research geophysicist with the U.S. Geological Survey National Earthquake Information Center, located at the Geologic Hazards Science Center in Golden, Colorado. His research focuses on improved real-time detection and characterization of earthquake sources, anthropogenic seismicity within the United States, and better spatio-temporal characterization of damaging earthquake sequences for long-term hazard assessment. Will received his B.S. in Physics at the University of Wisconsin – Madison and a Ph.D. in Geophysics at the University of Colorado at Boulder. His Ph.D. research primarily addressed issues of crust and upper mantle structure and the associated kinematic evolution of the Rockies during the Laramide orogeny. During his Ph.D., Will worked at the U.S. Bureau of Reclamation studying earthquakes induced by fluid injection at Paradox Valley, Colorado.